This is a Flushing-bound 7 train. Your next stop is… Beijing. I don’t need to tell you about Manhattan’s Chinatown. You’ve been there, or you’ve seen it in films or on television. New York’s oldest Chinese enclave is an amazing place. From the open-air fish markets to the cavernous dim sum palaces, it’s unlike anyplace else on the island. But from the high rents to the throngs of tourists, you never forget you’re in Manhattan. Ride the train an hour from Canal Street and everything changes. Getting off the 7 train at the end of the line puts you right on Main Street in Flushing, Queens. On a Wednesday afternoon, the area was bustling. People hurried between shops and restaurants, vendors handed out fliers, and cars and buses jockeyed for room on the street. Save for scattered English signage, it would be easy to believe the train out of Manhattan took you to a different country rather than a different borough. Making my way down the chaotic sidewalks, I searched out my destination: Golden Shopping Mall. Hidden in the basement of an unassuming strip of businesses was the food court that had brought me all the way to Flushing. This makeshift collection of stalls was everything I love: noodles, dumplings, offal and more. I had heard this was Flushing’s Mecca, and I did not leave disappointed. I sat down along a small counter at Tianjin Dumplings between two middle-aged men and ordered lunch. Four dollars got me a dozen dumplings filled with pork, chives, and shrimp. Sitting at the counter, with a tray of duck heads staring back at me, I dug in. Taking a cue from one of my impromptu dining companions, I speared one of the steaming dumplings with my chopsticks and attempted to eat it whole. Unfortunately, this seems to be an advanced technique, and my mouth still hasn’t recovered from the trauma. Burned and humbled, I tackled the rest of my plate with markedly less bravado. Fortunately, even with crippled taste buds the dumplings were delicious. Fairly thin-skinned and wonderfully tender, they made for an extremely satisfying lunch. My plate clean, I set out to explore. Walking the streets, I made my way to the other malls that seem to anchor the commercial experience in the area. The New World Mall just down the street feels much more like a typical western mall, albeit one whose stores almost all had signs written in Mandarin. Still stuffed with dumplings and not needing any clothes or electronics (among the mall’s myriad goods and services), I headed to the Flushing Mall a couple of blocks away. Older and less upscale than the New World Mall, the Flushing Mall was virtually empty, but that didn’t stop me from grabbing a cup of bubble tea in the small basement food court. Walking around Flushing was surreal. Just an hour from the heart of the city, it felt a world away from the guidebook-approved Manhattan Chinatown. If you find yourself in New York and want to see a Chinatown, skip Manhattan and head into Queens. 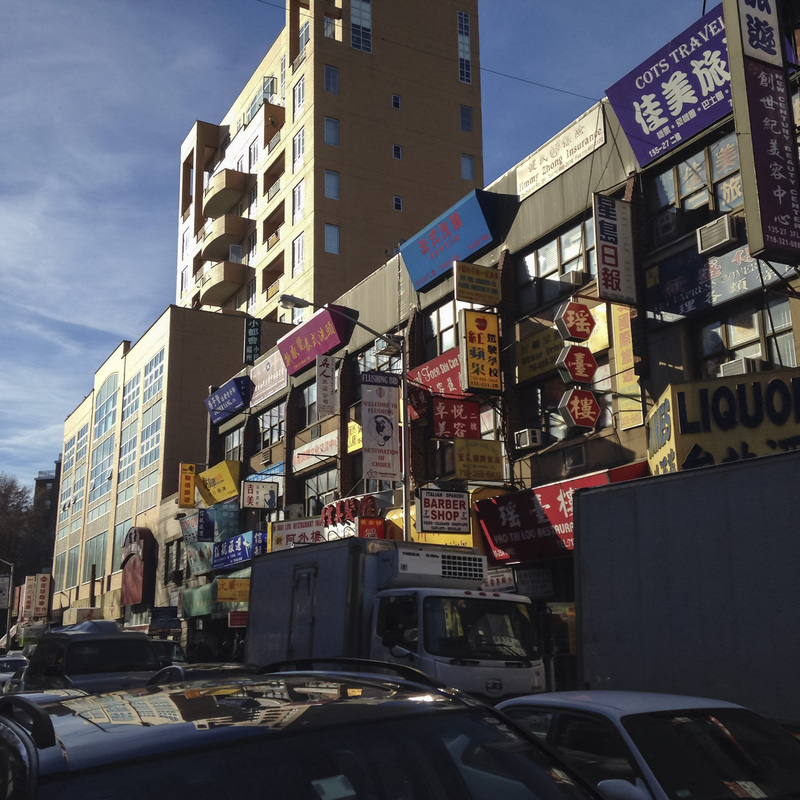 This entry was posted in Uncategorized and tagged china, chinatown, chinese, dumpling, flushing, food, new york, nyc, queens, travel by rabonour. Bookmark the permalink.